"Growth in part-time work is jeopardizing quality of life for library workers — and quality of service to customers, staff say"
The Toronto Public Library argues that it needs more capital spending to keep up with reader demand. This article is part of Torontoist’s special 2016 municipal budget coverage. If you value journalism like this and you’d like to see it year-round, then subscribe now. You’ll help fund a staff writer to hold City Hall accountable, and be a member of Raccoon Nation. Photo by photoanalysis from the Torontoist Flickr Pool. Library-goers in the post-Ford era are breathing easy now that their cherished institution no longer faces severe budget cuts. Ever since the 6 per cent budget decrease the Toronto Public Library system faced in 2012—the mayor’s office wanted a 10 per cent reduction—net expenditures have been on a gradual incline. With an average operating budget increase of 0.5 per cent over the past five years, budget increases have been much lower than inflation.The librarians have since put down their picket signs, and Anika Tabovaradan won the battle for her library to stay open after school. But the libraries’ fiscal woes are not over just yet—the TPL’s biggest obstacle lies within their long-term capital budget plan. Before we get to the capital budget, let’s take a look at the operating budget (which funds ongoing annual expenditures, like staff salary). This year, the library board looks to boost their operating budget by $3.4 million to $192 million—a 1.8 per cent increase over last year’s budget. The proposed number accounts primarily for salary and benefit costs as well as contracted services. But the final number could change as the Budget Committee and Council starts to address the budget proposals on December 15 (the proposed budgets are usually greater than what City Council approves). This year’s proposal comes with stats outlining a 13.5 per cent increase of total library use over the past decade. The libraries have experienced a 7.5 per cent increase for in-person visits, a 4.8 per cent increase in total circulation, and a hefty 40.9 per cent rise in “virtual visits”—a victory that can largely be credited to the department’s capital spending on Virtual Branch Services. Due to an increasing demand for online material such as e-books and e-magazines, and “unreasonably high prices” charged by publishers, the budget proposal allocates $220,000 towards material and supply expenditures for their growing e-collection. The budget submission adds that digital content has increased by 250 per cent since 2012. On the other end, the board has proposed a $28.3 million capital budget for 2016 as part of a $321.8 million plan to be dispensed over the next 10 years. Among various long-term TPL projects, the proposal includes renovations and expansions at the Wychwood and Dawes Road branches, a relocation of the Perth/Dupont branch, and, as part of a joint effort with the Parks, Forestry and Recreation department, additional funding for an underground parking lot at the Bayview branch. But the long-term proposal could face serious questions during the budget process. Currently, the City’s debt target sits at $153.7 million over the next 10 years, while the TPL’s proposed capital budget exceeds that number by $71.3 million—a 46 per cent overage. The 2016-2025 Capital Budget and Plan Update from the Library argues that the City’s assigned targets are “inadequate to meet TPL’s capital funding needs for building [state of good repair]” (the libraries’ multi-branch renovation program). The update adds that, because the debt targets are not adjusted for inflation in 2018, the target would create an increased backlog for the renovation program. Despite the $71.3 million in proposed spending that exceeds the debt target, there would still be a remaining $73 million backlog by 2025. The SOGR expenses become especially crucial as library usage increases—and so far, it has. From the Toronto Public Library’s 2016 Budget Proposal, pp. 9 [PDF]. Despite increasing capital needs, the City requests a decrease in the Library’s debt target (blue). The green in this graph tracks what the increase would need to be to track with inflation, while the white is what the library says is needed to keep their capital needs in good stead.The last two years saw a variety of big capital ventures for the TPL, including two new branches in Fort York and Scarborough Centre. The branches cost $9.1 and $10.2 million respectively, and have attracted attention for their swanky features—3D printers, digital innovation hubs, and DJ equipment for Toronto’s aspiring Tiësto’s. Each branch holds roughly 40,000 books, provides access to over a dozen public access computers and Wi-Fi, and are well-used. The Library is a beloved Toronto institution, as the response to the Ford-era budget cuts showed. How much Council is willing to fund its growth and support reader demand—particularly on the capital side—is an open question, and how councillors respond to this budget cycle will go a long way to provide the answer. There were a number of interesting public depuations heard by the Toronto Public Library Board meeting on November 23 held at North York Central Library. Alan Campbell, President of the Ontario Genealogical Society made a deputation regarding the consolidation of genealogical collections at the Toronto Public Library. 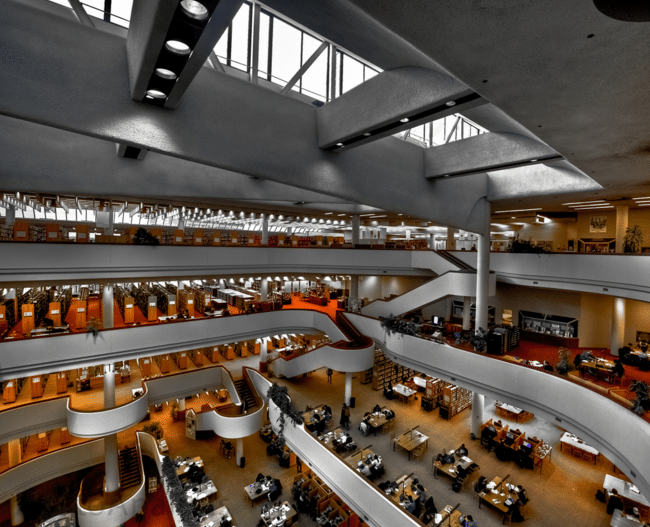 As a result of the major renovation of North York Central Library starting in 2016, the historical Canadiana Department located on the sixth floor of the library will close. It will be replaced by a reading lounge. The historical and genealogical material will be culled and consolidated with the collection at the Toronto Reference Library downtown. Campbell cited the long relationship between the OGS and the Toronto Public Library and expressed concern over the 'culling' process and the length of time the collection would be inaccessible to the public. Les Kelman, President of the Jewish Genealogical Society of Toronto, expressed concerns about the closure of the Canadiana Department at North York Central Library, calling it a 'great loss' for the people of North Toronto. He spoke of the short notice and lack of consulation for the relocation of irreplaceable historical material. He also spoke of the long relationship between the JGS of Toronto and the Toronto Public Library, and pointed out the strong working relationship they had with highly specialized Canadiana staff with experience in genealogical research. The need to develop a staffing plan that is central to the strategic planning discussions. That precarious workers are not able to deliver a robust service because of the challenges they face. That the library is squandering its invaluable resources of knowledge based workers. Maureen was able to use the North York Central Library renovation as a good example of plans made around physical spaces and services with absolutely no discussion whatsoever around a new staffing model, nor the impact on current staff working in Canadiana and the other affected departments in NYCL. If you are interested in seeing the plans for the North York Central Library renovation, visit the Teen Zone of North York Central Library where the architectural plans are on display. There are comments form for your feedback. Thanks to all the visitors to our booth at Word on the Street last Sunday. The Toronto Public Library Workers always have a great turnout and speak to hundreds of people. Our book bags, buttons and bubbles were a hit. So was our "End Precarious" icon, Rosie - thanks to those who took a selfie with Rosie the Riveter to help get the message out! Stay tuned for a special Library Workers' event at the end of October . . . . news to follow.